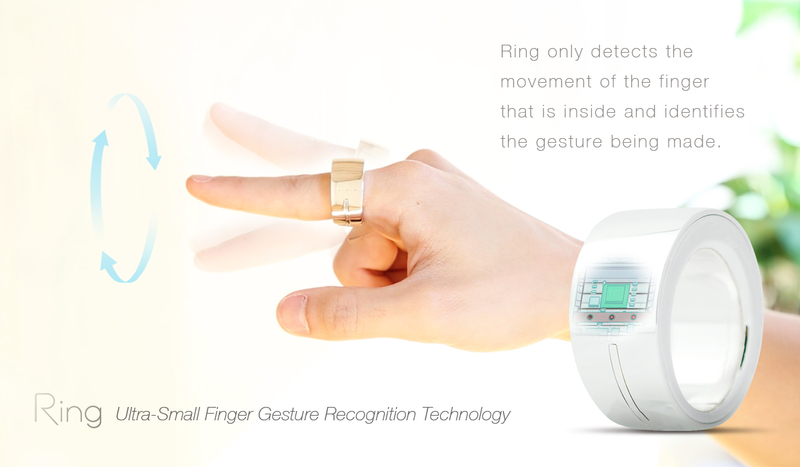 Ring is a small wearable device that gives you control of just about anything with a simple wave of your finger, and has enough features to make even Gollum jealous. It’s functionality is based around gestures you make with your finger that serve as input to a paired smartphone via Bluetooth. iOS and Android devices are currently supported, and Windows phone is on its way. There are around 1000 gestures Ring understands that serve as “shortcuts” to launch other apps and trigger events. Those shortcuts are picked up by the accompanying app that interprets them into actions taken by your smartphone. Want to open iTunes? Just draw a music note in the air. Need to write a quick email? Draw an envelope. Need to turn a lamp on? Simply draw a lightbulb and a wifi enabled outlet will respond. Another feature that is new to the wearable device market is the ability to act as a payment gateway. When shopping at retail stores, restaurants etc. that accept NFC you can complete your transaction with a simple checkmark gesture. As far as communication, the device will pulse and light up when you receive a new text or email, and has a full alphabet at your writing disposal. The idea of responding to a text by writing in the air sounds pretty awesome, though I would prepare for some interesting looks from passerby who might think you’re conducting the music in your head. While other wearable devices such as smart watches, or Google Glass require some portion of your visual attention, Ring may be the only internet enabled device on the market right now that does not require you to keep your eyes glued to it. This could provide a potential solution for the texting while driving problem, and offers a way to check your email on the go without the fear of tripping. Ring can currently be purchased through its Kickstarter campaign page for $185, which gets you one Ring, the accompanying app, and a neat little charging stand. Ring is a small wearable device that gives you control of just about anything with a simple wave of your finger, and has enough features to make even Gollum jealous. It's functionality is based around gestures you make with your finger that serve as input to a paired smartphone via Bluetooth. iOS and Android devices are currently supported, and Windows phone is on its way. There are around 1000 gestures Ring understands that serve as "shortcuts" to launch other apps and trigger events. Those shortcuts are picked up by the accompanying app that interprets them into actions taken by your smartphone. Want to open iTunes? Just draw a music note in the air. Need to write a quick email? Draw an envelope. Need to turn a lamp on? Simply draw a lightbulb and a wifi enabled outlet will respond. Another feature that is new to the wearable device market is the ability to act as a payment gateway. When shopping at retail stores, restaurants etc. that accept NFC you can complete your transaction with a simple checkmark gesture. As far as communication, the device will pulse and light up when you receive a new text or email, and has a full alphabet at your writing disposal. The idea of responding to a text by writing in the air sounds pretty awesome, though I would prepare for some interesting looks from passerby who might think you're conducting the music in your head. While other wearable devices such as smart watches, or Google Glass require some portion of your visual attention, Ring may be the only internet enabled device on the market right now that does not require you to keep your eyes glued to it. This could provide a potential solution for the texting while driving problem, and offers a way to check your email on the go without the fear of tripping. Ring can currently be purchased through its Kickstarter campaign page for $185, which gets you one Ring, the accompanying app, and a neat little charging stand.